Varulae needs you to recover her crystal ball from the haunted ship. Is anything in Anvil not haunted? 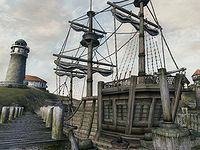 Speak with Varulae on the deck of the Serpent's Wake in Anvil Harbor. She asks you to retrieve her Crystal Ball from the cargo hold of the haunted ship. Defeat the Spectral Sailors or run past them making your way down to the hold. Return Varulae's Crystal Ball to her, she rewards you the "leveled" cutlass, Redwave. On the west side of Anvil docks, there's a ship called The Serpent's Wake. Speak with Varulae standing on the main deck, if spoken to she'll ask you to go down to the cargo hold and recover her crystal ball, but the ship is haunted. When you agree to help, you're given a key so that you may enter. You can either run this quest quickly, without a fight, or stand against five Spectral Sailors; as with all ghosts, they are immune to normal weapons. In the first door is a ghost that will sometimes stay in the room, so you can use a ranged spell to kill it easily, even at a low level. Once a ghost dies it leaves a sharpened cutlass, which can be used to fight other ghosts. Inside the ship there is a trap door to the mid deck on the floor to your left, and a normal door in front of you. There's a Spectral Sailor behind the door in front, but some nice treasure too. If you decide to enter the room up ahead, make sure you search the 'Dead Captain' to find the Serpent's Wake Captain's Key and open the Captain's Chest at the foot of the bed to get the randomly generated treasure. Proceed to the mid deck through the trap door. There are two Spectral Sailors here, and they'll most likely attack you at once. You can fight or run across the corridor, to another trap door leading to the cargo hold. There's nothing of interest in the mid deck anyway. Downstairs, there's a Chest just next to where you enter, and in it is 'Varulae's Crystal Ball' that you're after. The last two Spectral Sailors are here as well. There's no need to fight them if you choose, although there is a bottle of Skooma and some gems behind them. Track your steps back to the main deck, and speak with Varulae again to give her back her crystal ball you fetched and receive Redwave, an enchanted cutlass, as your reward. In the quest Following a Lead you will find the Traitor's Diary, which reveals what happened to the ship's crew. If you don't kill the ghosts they will follow you up onto the deck and even out to the docks, where any NPCs who are around will be drawn into the fight. The ghosts are much tougher than most of the quayside denizens, and will probably kill some of them (Varulae however is invulnerable while the quest is in progress). If you wish to take advantage of this as a battle strategy, you can bring them out of the ship one at a time. Leaving the zone does not cause them to reset. The sword Redwave is technically leveled, but all seven variations of it are exactly the same. Thus, for all practical purposes, you receive the same reward no matter when you complete the quest. You can pick-pocket the crystal ball back from Varulae after you've given it to her. This isn't recommended, however, as it's still considered a quest item and you can't give it back to her, leaving you stuck with it forever. 10 A High Elf Sorceress named Varulae has asked me to retrieve her crystal ball, located in the hold of the ship the Serpent's Wake, which is moored up in Anvil Bay. The crystal ball is in a chest in the ship's hold. I should be careful, however -- the crew have all been slain, and now roam the ship's decks as creatures of undeath. 20 I have retrieved Varulae's crystal ball. I must now return it to her on the top deck of the Serpent's Wake. 100 Yes I have given Varulae her crystal ball. She gave me the captain's enchanted cutlass as a reward. It is possible to use the console to advance through the quest by entering setstage MS93 stage, where stage is the number of the stage you wish to complete. It is not possible to un-complete (i.e. go back) quest stages. See SetStage for more information. This page was last modified on 24 October 2018, at 06:27.